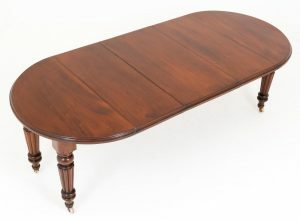 Mahogany 3 Leaf Extending Dining Table. Standing on Original Brass Castors with Ring turned legs. The top of the table featuring quality figured timbers and comes with 3 x extra leaves making this a very versatile dining table. 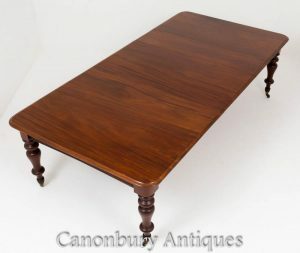 Victorian Style Mahogany “D” End Extending Dining Table. This piece has ring turned and fluted legs with brass and porcelain castors. The top having a double moulded edge. Featuring 2 x extra leaves and comes with a wind out mechanism. The table will seat upto 12 people and is in excellent condition. 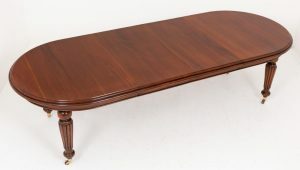 William IV Mahogany Circular Extending Dining Table. This table has the original brass and porcelain castors, ring turned and fluted legs. The table has a wind out mechanism (by the manufacturer Joseph Fitter of Birmingham) and has 3 extra leaves. This table has been fully renovated and is in excellent condition. Will seat upto 12 people.